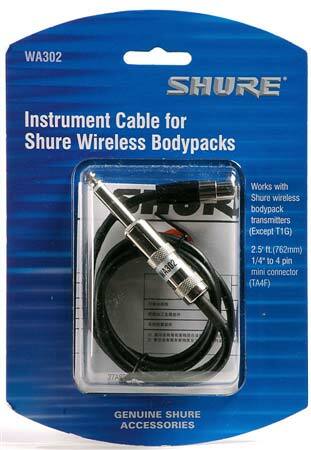 Shop Shure WA302 Instrument Wireless Cable from AMS and enjoy Fast & Free Shipping. Connect your guitar to your Shure wireless system with the Shure WA302 Instrument Wireless Cable. Made to give you ultra-dependable performance, the Shure WA302 connects the T1, UT1, SC1, LX1, ULX1, UC1, and U1 bodypack transmitter to a guitar or other instrument. When you're free of length limits and tangles of cables, you're free to perform and communicate your best.